Salt plates impart subtle flavor onto food, resulting in a milder flavor than when using ground salt. Himalayan salt is rich in trace minerals, which adds to the depth of flavor your foods will achieve when cooked, chilled, or simply presented on the plate. 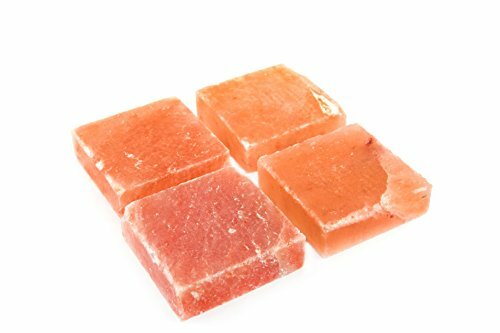 Himalayan salt plates have naturally high moisture contents, which allow the plate to be heated or chilled to extreme temperatures. These four mini salt plates allow for individual servings and beautiful presentation. Each guest can have a unique dish with these gorgeous pink salt slabs. Featured above are Salted Caramel Apples. Set of 4 allows for individual servings and beautiful presentation, Each Plate Measures 5" by 5" by 1.5"